Silence in the dressage arena? Not in Aachen. Okay, not always. There was definitely a fantastic atmosphere this evening during the LUMILEDS Prize, the Grand Prix Freestyle of the CDI4* Tour, when Shelly Francis was presented with the golden rosette and Ingrid Klimke let Franziskus dance to the sounds of DJ Ötzi! “That was the best freestyle test we have ever performed!” the US American rider Shelly Francis blurted out after riding to victory with Danilo on a score of 79.305 percent. “It was great fun! It was fantastic! I was so happy that I cried,” she raved. “Brave Junge,” she praised her horse with an unmistakable American accent. Hey, German? “Well, it is a German horse!” To be precise an Oldenburger. “It wasn’t my best Grand Prix. Which is why I was simply overjoyed that he performed so well today, regardless of the result.” Indeed, it sufficed to take the victory. To top everything she was given a champagne shower by Chef d’Equipe, Robert Dover, after the prize-giving ceremony. Corks were popped by the Klimke family too after Ingrid Klimke and Franziskus had, according to own accounts, performed the best freestyle of their joint career, which was rewarded by the judges with 78.390 percent and 2nd place. “He was better than ever,” the overjoyed master of riding commented when she rode out of the stadium to the thunderous applause of the crowd. “He loves it when the crowd cheer and clap!” So, it certainly wasn’t quiet in the arena tonight. Franziskus flourishes when the spotlight is turned on and the curtain goes up! It moved his owner, the stallion keeper, Wilhelm Holkenbrink, to tears because he had always dreamed of seeing one of his horses perform in Aachen and now he even has one that earned a standing ovation in the Deutsche Bank Stadium. 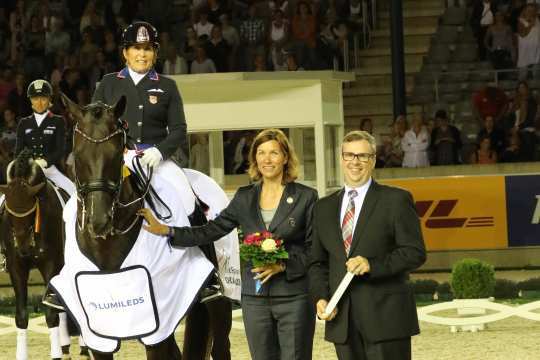 The US riders had a second reason to celebrate tonight, because Olivia Lagoy-Weltz finished third with her Danish horse, Lonoir, on a score of 77.435 percent. The winner is congratulated by Willi Thelen, Vice President and General Manager Lumileds Automotive Lamps, Chairman of the Executive Board Lumileds Deutschland, and Stefanie Peters, ALRV Supervisory Board member.